So, you have a Windows based computer and want to learn PHP? No problem. You can install Apache, PHP, MySQL by hand and then try to configure them to work together. But wait, there is a better and faster way. And it is Open Source! There is a wonderful little package that will make your life easier. It is called WAMP (Windows, Apache, MySQL, PHP). It is set of all the tools and services that you will need to start developing PHP applications on Windows machine. First step is to download it. 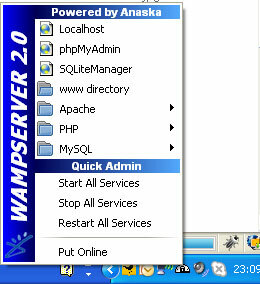 Go to http://www.wampserver.com/en/download.php and download the package. After you have downloaded it, double click it and follow the installation instructions. When the install is finished, you will have new icon in your tray that looks like a speedometer. If everything went fine, open your browser and type in http://localhost and you should be taken to the WAMP welcome page. Congratulations, you successfully created PHP developing environment. WAMP comes with PHPMyAdmin which is really useful tool for managing your MySQL databases. You can manage your web server directly from your tray. Sometimes if things don’t work and you have Skype installed, go to Skype Advanced Options, and under connections make sure that Use ports 80 and 443 as alternatives for incoming connections is not checked. Save this file in yoour WAMP www folder (the default location is c:\wamp\www) and name it test.php. Now go to http://localhost/test.php and you should see a lot of PHP related info. If you will have many projects, organize it in folders (c:\wamp\www\project_1 for example) and access it through http://localhost/project_1 . That’s it for today. You have learned how to make a PHP development environment under Windows operating system.